Water rises into pools formed by large boulders in a steep and narrow canyon. Fan palm trees shade the pools as the water slowly slips between giant stones as it makes its way back under the sandy soil further downstream. Parking area at end of Canyon Road, 4 miles west of Twentynine Palms off Hwy 62. 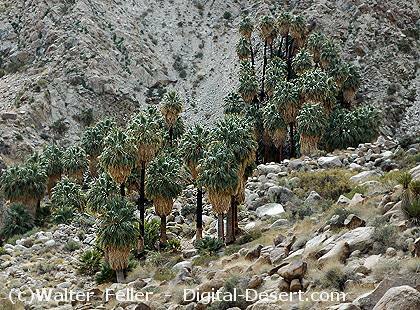 Description: Several stands of fan palms, evidence of past fires, and pools of water are found at the oasis. The plants in this area are especially fragile, so walk lightly. There is a 300' gain in elevation from the parking lot to the high point along the trail. The trail then loses nearly 300' on the way to the springs, therefore, coming back out there is again a 300' gain, then drop in elevation. Structure-- All natural or naturalized plant assemblages that include California fan palms are recognized as Palm Oasis habitats, cultivated stands of California fan palm are not considered Palm Oasis habitats. While within the defined northern end of the boundary of the Pinto Basin and Mountains ecosubsection, the transition at the base of the mountains to the Lucerne - Johnson Valleys and Hills ecosubsection is abrupt.